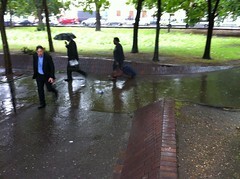 Wet July so the Euston Puddle is back. Last seen October 2010 – earlier chapters here. It seems just as bad as it was before I got Network Rail, TfL, the London Boorough of Camden and Skanska to sort it out. Do you suppose I have to mobilse them again each time it rains? 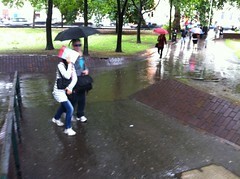 Next post on this topic is Spring 2012, as the Puddle prepares for the Olympic Games.